Getting updated Windows media is certainly easier than it used to be. Back in the day, you'd have to slipstream updates into your installation media. It was a pain, and prone to cause problems (mainly because you could slipstream other things in there, too). Microsoft has seen the light and provides ISO downloads of the current version of Windows (Note: This is not a "free" Windows license -- you still need to pay for that, or install on a machine which has been previously licensed). Actually using that ISO is not quite straight forward. You could burn it to a double-sided DVD, but I don't even own a computer with an optical drive currently. USB is the way to go. However, while Linux ISOs are typically multi-boot images (files that can boot both CD and USB, on both BIOS and UEFI machines), it appears Microsoft has not leveraged that knowledge. This USB fails to boot. The only official way to create USB-bootable Windows media is to use the "Media Creation Tool" on Windows. You may encounter the same issue I did: I don't have Windows installed yet! There is an alternate way, using a project called woeusb. Running the GUI simply doesn't work, as more command-line options appear to be required. One of the files in the image is larger than 4GB, which requires using NTFS on the USB disk. The following command is what I used to flash the Windows 10 1809 ISO to my USB stick (be sure to get the correct device name for your USB -- this command will wipe it). Be aware that this USB media will not boot with secure-boot enabled, though the resulting Windows 10 installation will work with secure-boot. If you're considering trying out autocross, I say go for it. I'm very new, and have found people at the two events I've attended (WOSCA #1, and PITL #3) to be friendly and extremely helpful. Additionally, you can do it with your own car. You don't need some sort of special race-spec track beast. Both events have also had loaner helmets available (although I spent $200 and bought my own helmet meeting the appropriate standards). I've posted a video of the PITL #3 event on youtube. Additionally, I've created a playlist, which also contains my WOSCA videos. When I left off after my third adventure with ffmpeg, I decided that I wanted to attempt video transitions next time. Well, it's next time. Like always, I concatenated my dashcam video chunks, then trimmed them as appropriate. This was done like my previous posts, using -codec copy to preserve quality. I decided to attempt a timelapse intro/outro of my drive to the event. 32 times seemed to be a good balance of not-too-long, while also being somewhat fluid. That command is the trimmed commute clip as input. The filter is basically speeding up the playback. 1*PTS would be normal speed, and 1/32 = 0.03125. I did not timelapse the audio, although that is possible too. I also made title images in Gimp, like before. I went through several iterations to reach the final video I wanted. The best resource I had was this post by Mulvya on Stack Overflow. Initially, I had five video streams, configured to fade in/out as required. However, I very quickly hit a performance issue related to ffmpeg's overlay filter. Previously I used concat, but performing a transition requires the videos to actually overlay. To illustrate the issue, assume you have two one-minute videos, and you want a two-second transition between them. Your final video will be 1:98. ffmpeg will stretch the 1 minute video's last frame to the length of the video, which means it is now compositing 98 additional seconds that could technically be preserved unchanged. Attempting to work around this (by fading out the source video, trimming it, etc) seem to basically mean you're compositing a transparency. The performance is still affected. Then remember I'm compositing five videos together, each one building on the previous. This very quickly went from real-time to 5fps processing time. The "solution" is to chunk each clip into three parts: A A short beginning and ending clip a few seconds long, and a middle clip that requires no modifications. Now you can overlay the two 2 second clips to create your transition, and concat the other 1:96. The performance benefit is substantial. Lines 5-17 are my source input files. All visual files are here (video, overlays, etc). setpts to guarantee every video segment starts its counters at 0 (instead of their pre-existing timestamps). trim is used to cut the video. Values calculated by hand. The end of each video has a fade-out. You could do a fade-in on the start segment, but that has additional quirks I'll discuss shortly. Each configured with a fade-in, and fade-out, and trim values. Line 53/54 are the short overlay transitions. 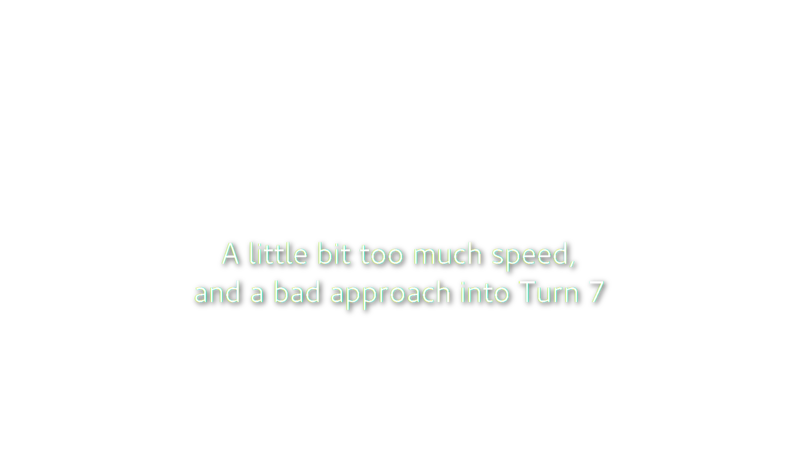 It is important to note here that you could use a fade-in on the start video instead. However, you'll need your fade-out to be the exact correct length, otherwise your fade-in will be truncated, and/or your fade-in won't transition seamlessly to the rest of the clip. This way was easier. Lines 50/51 are very similar, but for the Logo and main title. Lines 68-73 simply concatenate the short transition overlays we've created, with the untouched video clips inbetween. This saves soooo much processing time. Line 80 is the output file name. You also might notice there's no sound. Attempting to do sound at the same time caused a number of buffer issues, video stutter, sound not lining up. Furthermore, while this video renders "faster" than a pure-overlay approach, we're still talking >10 minutes, so trial-and-error to fix sound was very time consuming. I eventually decided to just do the sound separately, then merge them afterwards. This command is actually very similar. Interestingly, there is a crossfade functionality for audio. Why this doesn't exist for video, I'll never know. Lines 115-119 are stringing the audio together using the acrossfade filter. Not much too it. You may need to do a few rounds of Audio & Merging to ensure the sound lines up with the video. I want to combine a few clips together, with a 5-seconds of intro text on each one. Using the methods I've described in previous ffmpeg posts, I trimmed the clips, ensuring that there is at least five seconds of lead-in on each clip for the text. I basically just used his example, except I changed the duration, and offset since my title png is already 1920x1080. Also, all that youtube codec stuff. I did have trouble with the last few seconds of video being clipped with -shortest. I ended up specifying the appropriate -to length. This creates a third input stream, which is also a looped image. We create stream [oe] (overlay end), which does a fade-in at 16 seconds. We then take [v] and overlay [oe] on it, creating [vf]. We then map [vf] to our output. The video is what I set out to make. It might have been nicer to do some audio fades, but I'll live. I want a video with the rear camera until the Volvo passes, then the front camera after. I want to use the front audio for the whole video. Luckily, the front & rear videos were synced to within a fraction of a second. Close enough. Rear video, starting at 2:40, ending at 4:24, when the car passes me. You'll note I'm using the same ffmpeg voodoo I used last time to help youtube processing time. I was expecting to have to remove the rear audio, but interestingly enough, it was gone already. I suspect the overlay filter killed it? No idea, actually. I'm fine with keeping the left of the front frame, as it looks "good enough". If I wasn't, I'd have had to have adjusted the overlay offset, as well as the crop offset. 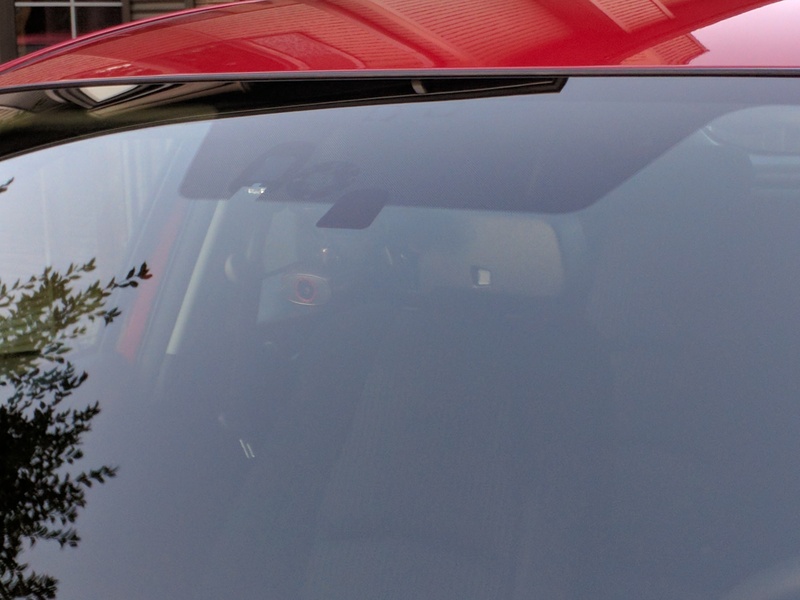 Just as a note, I fixed the resolution (and removed the datestamp from the rear camera) before I hit the track on Saturday. So I didn't have to the cropping for the videos I put on youtube earlier (but filmed chronologically after). 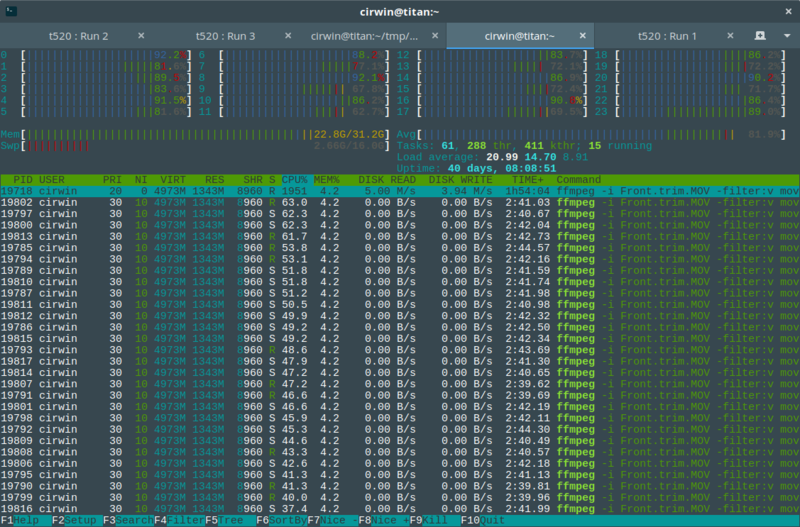 My CPU seems to be taking it easy today. Maybe its upset I made it work on Easter? Or this task just didn't parallelize as well. Just like the first two times, I'm assembling my Watkins Glen 2017 track footage with ffmpeg. However, I encountered a small issue I didn't last year, plus I decided to change things up a bit with codecs, and audio selection. [file @ 0x55d7ded86680] Protocol not on whitelist 'crypto'! (nested protocols) are restricted to a per protocol subset. Unless file was disallowed becayse it was used via pipe. Anyway, solution was simple enough: Whitelist 'file', and 'pipe' (we're piping in the file list). Uploading to youtube is always a lengthy process, as youtube needs to reprocess the video. They have documented the ideal format characteristics. And I found a blog post describing the ideal youtube paramters in ffmpeg terms, so I didn't have to read the man page again. Yay. Note that hardware encoding is not an option here due to the video overlay filter. While comparing the Front & Rear audio clips, it appeared that the audio from the rear camera might be a bit better. It picked up our talking a little bit less, and picked up the (rear/mid) engine noise a little bit better. Also, the front camera had an intermittant click/hiss/whine in some videos. I haven't figured that out yet. I wanted to do a side-by-side comparison of front & rear audio, so I needed both output files. Additionally, since the bulk of the conversion time was video, and that isnt' changing, I can just swap out the audio on the video from above. Note that I re-applied the youtube audio codec wizardry. I decided to update the 3/4 of my Palm WebOS devices. 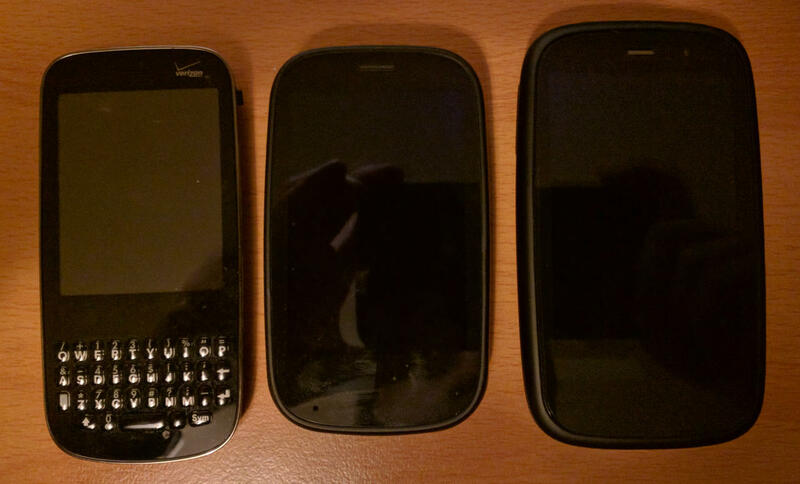 The Pre (not pictured) and Pre2 (middle) were my primary, daily-driver phones for over two years, from September 2009 through to spring 2012, when I acquired a Galaxy Nexus and made the jump to Android. The Pre3 (right) I also picked up on eBay. It came in box, with all accessories, and a spare battery. The Pixi (left) I picked up cheap on eBay. "For Parts", because it "Does not move from activation screen". Now, the Pixi was a low-end device when it launched. It doesn't even have WiFi. This isn't a device you'd buy to use. But as a curiosity, I was interested. Due to the Palm servers being taken offline in January 2015, the activation process will never complete. Interestingly, this "Sprint" Pixi has a "Verizon" faceplate, possibly swapped from a Pixi Plus at some point. Model number confirms it is a Sprint device.. The Pre & Pixi are CDMA phones, locked to Bell Mobility and Sprint respectively. So they're effectively useless. The Pre2 & Pre3 are HSPA+ phones, and I should be able to use them on my current provider, assuming I can locate a SIM adapter. Following the MetaDoctor Wiki is fairly straight forward. "MetaDoctor" is a community-driven makefile that alters the above "WebOS Doctor" images with user-chosen modifications. After fetching metadoctor from github, you're required to fetch the WebOS firmware images from Palm. Palm, of course, doesn't exist currently. Thankfully, you can get all WebOS Doctor images via archive.org. An important resource is the MetaDoctor README file. It outlines all the options available. Myself, I just want to a few options. Instructions say to modify the Makefile, but passing args works just fine. These make commands will output a few assembled firmware images to the build directory. Note that I'm using CARRIER=att for the Pre3, due to this being an AT&T phone. However, ADD_EXTRA_CARRIERS=1 should provide whatever additional data (APN?) for it to work on my network. The Pre2 uses CARRIER=wr. There is no "rogers" carrier, but it is on the wiki. However, it links to the webosdoctorp224pre2*wr*.jar file. Interestingly, WebOS Doctor images are more than just a firmware image, like you'd have with Android (or other devices). They're actually executable java bundles, which will push the encased firmware to the device. So you execute it on your computer. On the bright-side, they're Java, so they should work on any platform. On the super-bright-side, they actually work just fine with the OpenJDK installed in Fedora. No need to tarnish your system with Sun/Oracle Java. Luckily, none of that matters on Fedora 24, since novacom is actually packaged. Last metadata expiration check: 0:52:44 ago on Wed Sep 14 22:24:59 2016. You'll need to run it as root to allow direct access to USB devices (You can probably configure some udev permission rules, but I won't be doing this often enough to bother). You can instruct it to fork, but I preferred opening a second terminal, so I could the process when I'm done. You should see a few lines of output indicating a device was found. A few clicks of "Next" should get your firmware flowing. Note that one of the 'next' buttons will be disabled if your device isn't found. As mentioned above, the Pixi was stuck in perpetual activation. You'll need to force it into a mode that will accept firmware. This is sort of like bootloader mode on Android. 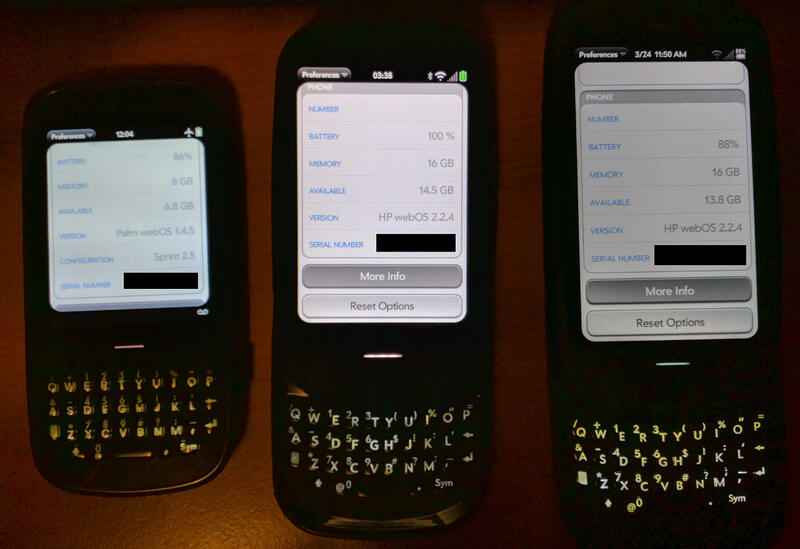 This process should be identical for all Palm WebOS hardware. The updater should see the device and enable you to load the firmware. 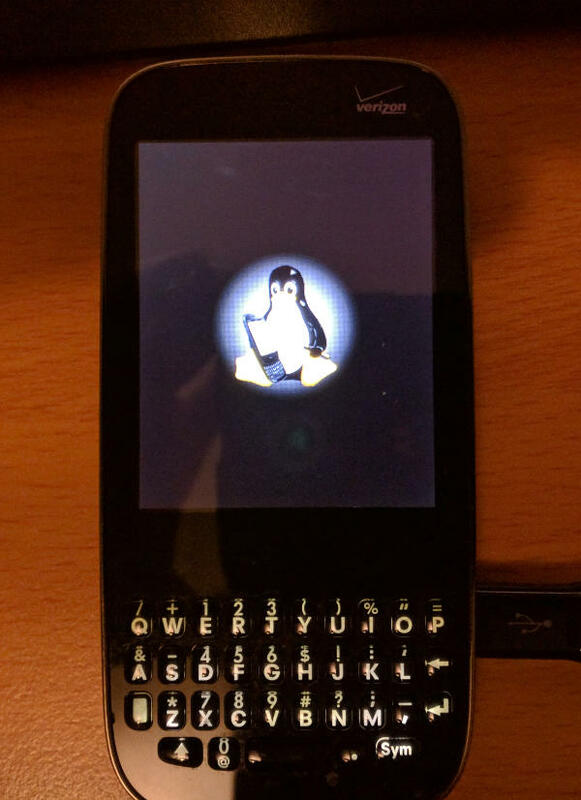 After a successful update, the initial boot screen will be a picture of Tux with a Palm Pre. After booting up the Pixi, I noticed it immediately started in "International Roaming" mode, notified of pending voice mail, and has a phone number assigned to it. I've immediately placed it into airplane mode, then yanked the battery. Since this device lacks Wifi, there is very little reason to look at it again. There is a process to install WebOS 2 onto WebOS 1 devices, like the Pre and Pixi. I actually used WebOS 2 on my Pre when it was my primary device back in 2011. It added some notable features, such as voice dialing (handy with bluetooth). It was perfectly functional, though a tad sluggish at times (it was targeting better hardware). The script will list the multiple WebOS Doctor images required at the top. You'll need to preemptively fetch these, as the URLs are bad (pointing to offline Palm servers, again). Note that they use a slightly different naming scheme (they do not get the version appended to the end). The firmware install procedure is the same as above. Note: Yes, WebOS Technically still exists. However, this article isn't talking about the TV OS version made by LG. While this article was actually written to discuss getting Palm devices usable, I felt some preamble was necessary. I've got a soft spot for Palm. My first PDA was the Palm Vx, possibly the greatest PDA ever made. Easily get days of battery from a device that can store all your calendar and contacts information, synchronizing periodically with your master copy on your computer. Palm lost its way with later versions of PalmOS. Devices got more spec competitive, but batteries didn't. My Tungsten T3 while technically superior in every spec, was actually less capable of performing it's primary PIM tasks than the Vx before it. Eventually Palm decided to get their act together. Palm's WebOS showing blew me away. I wanted one so much that when they finally released in Canada, I walked into a Bell store in September 2009 and signed a 3-year contract, despite being laid off work only a week earlier. The biggest complaint was the Palm Prē launch hardware. While very comparable spec-for-spec with the iPhone 3G and 3GS, WebOS featured multitasking with multiple running applications. Apple didn't. End result was the Prē was often laggy and slow. It was unfortunate. Palm quickly released an updated Prē Plus in May 2010 with twice the memory. Eventually, the Prē2 (released October 2010) would reveal what a WebOS device should be like. I actually had one shipped up from the United States (since Bell had started converting from CDMA to HSPA+, just in time). However, Palm was struggling financially. Before the Prē2 was released, HP bought Palm. This was a good thing: Palm will finally have the financial backing to take on Apple and Android platforms. Looking forward, the Prē3 was on the horizon for 2011. Featuring a major CPU upgrade, a significantly higher-res screen, and a refreshed design. Launching alongside the TouchPad tablet, there were some amazing demos. Tapping content between devices was mind-blowing at the time. Anticipation was high. Months passed. Finally, the Prē3 launched in Europe on August 16, 2011. "US is coming up in the near future". Two days later, on August 18, 2011, HP kills Palm. There was hope that the OS would continue, other hardware vendors might pop-up. Unfortunately, none of that happened (LG smart TVs aside). Due to the very open nature of WebOS (every device being a development device after a quick, official procedure) there was already a wide community modifying WebOS. It was due to the efforts of these people that WebOS 2 was backported to the unsupported Prē (including features like voice dialing, etc). WebOS MetaDoctor allowed users to spin a new, customized WebOS image with pre-applied applications, patches, and features (including massaging hardware support). Then was then flashed to the phone for a customized user experience. In late 2014, HP announced they were shutting down the authentication servers. 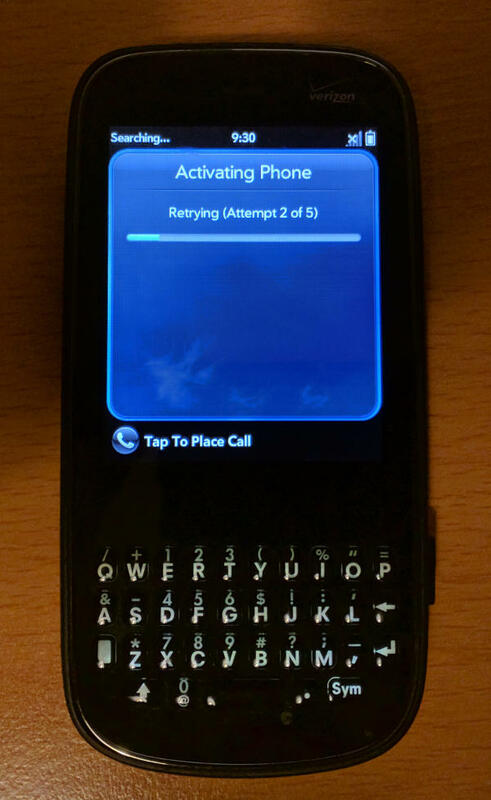 Considering a Palm account was a required account for device activation, this had the potential to be the final nail in the WebOS coffin if it wasn't for MetaDoctor allowing you to skip the Palm account step. Luckily, HP decided to Open WebOS, as well as the Enyo app framework. This allowed others to continue development of the platform. LuneOS was born, and began modernizing. While this unfortunately means that it can't run on the old Palm hardware, it does run on (slightly) newer Nexus hardware (Galaxy Nexus and Nexus 4). Stay tuned for articles on both Meta-doctoring Palm hardware, as well as running LuneOS on a Nexus 4. 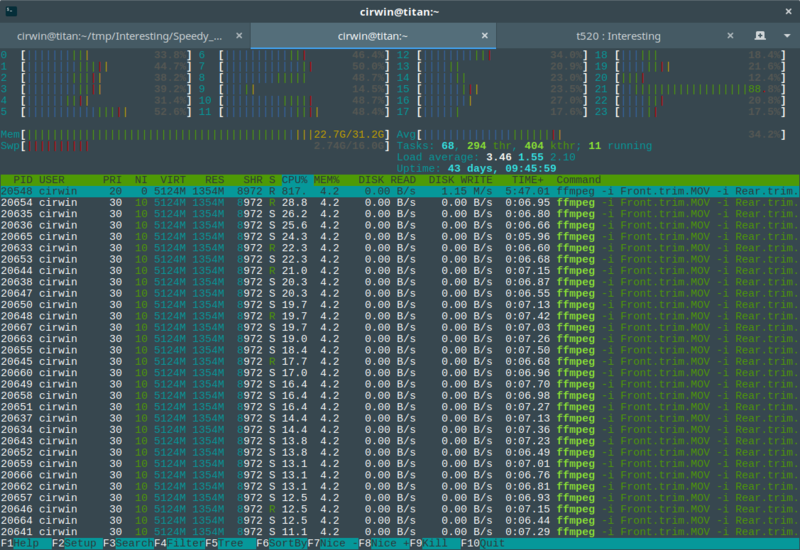 Snapper is an excellent utility that provides hourly snapshots of btrfs subvolumes. Fedora ships with selinux enabled by default. This is excellent, and shouldn't be disabled. To allow this, most software in Fedora has appropriate rules defined, including snapper. However, snappers rules only allow it to work on / and /home. If you wish to use it to snapshot /mnt/data, or /srv, or any other particular path, you're going to have a very bad time. While it is certainly possible to define new rules for paths you wish to back up, I decided that in this one particular case, snapper should be allowed free reign. The above command tells selinux to treat snapperd_t (the context snapperd runs within) as permissive. Rule violations will still be logged, but snapper will be allowed to continue. I just attended the Watkins Glen opening day for the second year. It was, again, a blast. I made some slight adjustments to my ffmpeg assembly procedure from last year. After the usual synchronization samples were made, it was time to perform the final assembly. You can see the resulting videos on youtube: Part 1, Part 2, and Part 3. Part 3 has some bad sound. I'm not sure why.